This quilt was my Grandparents Christmas gift. It almost didn't even get made. I had decided that I wanted to make a quilt for my grandparents way back in September. But, I didn't get around to starting even starting it until a week before Christmas, and it had to go all the way across the country. 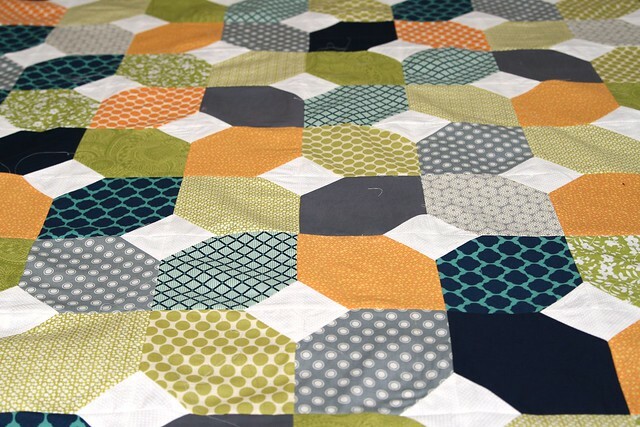 This quilt is pattern pretty simple so I was able to get it done and in the mail and it arrived just in time on Christmas eve! Most of the fabrics came from JoAnn's with the exception of the green dot and orange dot fabrics, those are Amy Bulter Full Moon fabrics from her Lotus line. 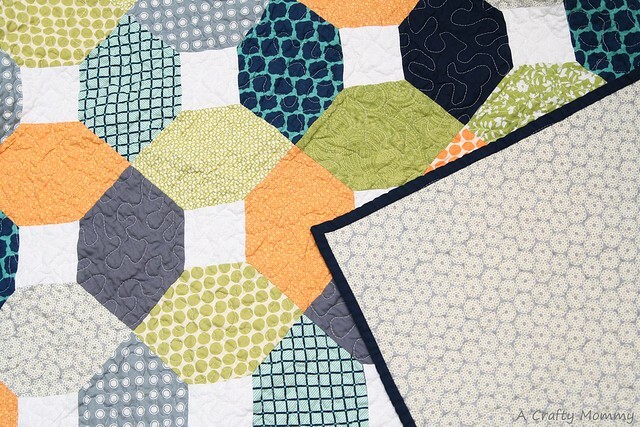 I swear picking fabrics is the hardest part of quilting for me. 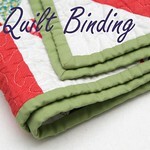 I must have stood in the store staring at quilting fabric for about an hour pulling bolts off the shelf and putting them back. I really like the green, gray, orange, and blue color combination that I ended up with and was excited to see it all come together. 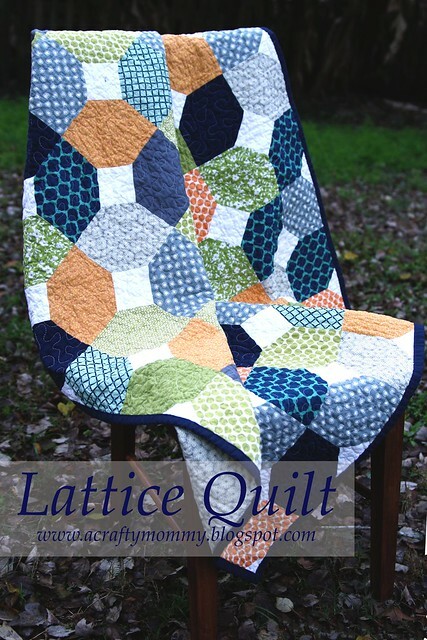 Want make a lattice quilt? It is pretty simple. 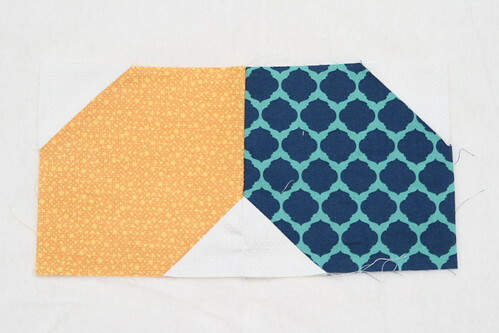 Start by cutting your squares, you will need 80 colored squares that are 6" x 6" and 160 white squares that are 2.5" x 2.5"
Place 2 white squares right side down on top of one colored square, lining them up with opposite corners. 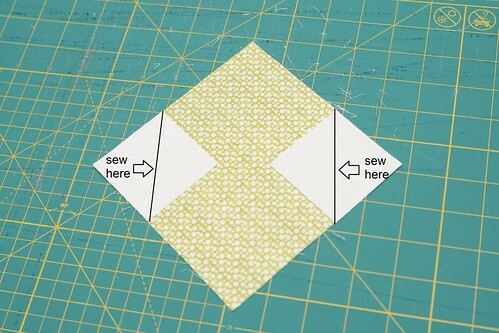 Sew from corner to corner diagonally across each small square. 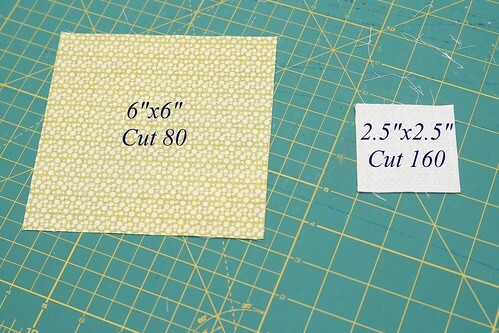 Cut off the extra 1/4" away from the seam. 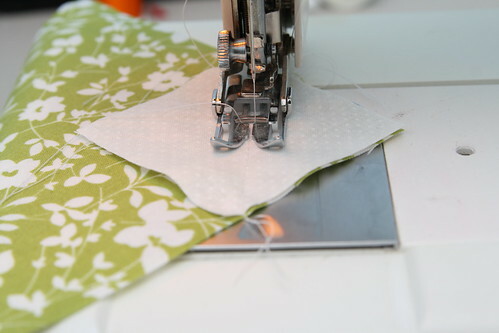 Line up the seams on two of your squares and sew them together. Keep adding squares to make a zig zag pattern. 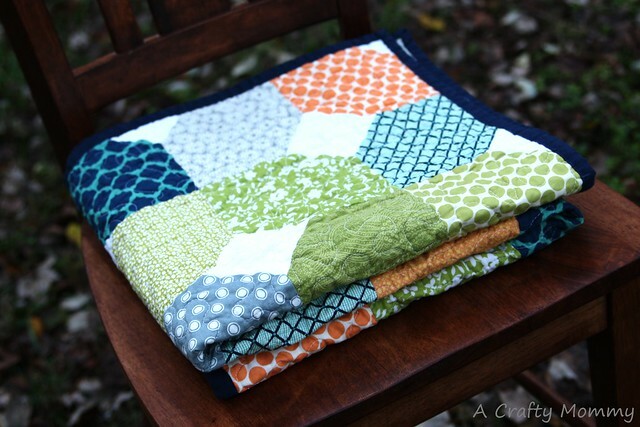 Sew all your squares into rows of 8 squares. You should end up with 10 rows of 8 squares. Sew 2 rows together, lining up the white parts. 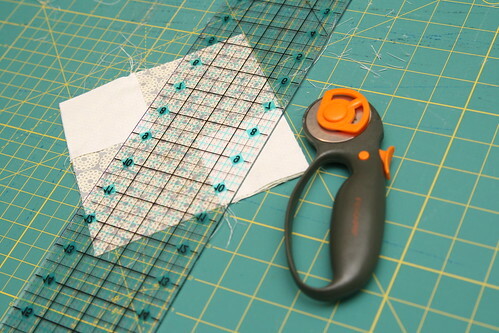 Continue adding rows until all 10 rows are sewn together in a lattice pattern. Thank you for the great tutorial! 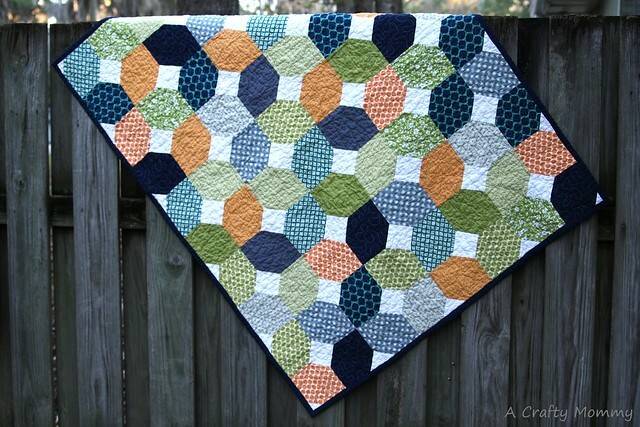 I have been looking for a cute but no too complicated pattern to make a quilt for my best friend's baby. This is perfect! Thanks Jenniffer! 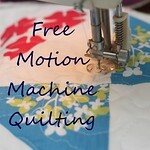 I press the seams open because it makes the seams a little less bulky, I find it easier to quilt that way. Love this design. 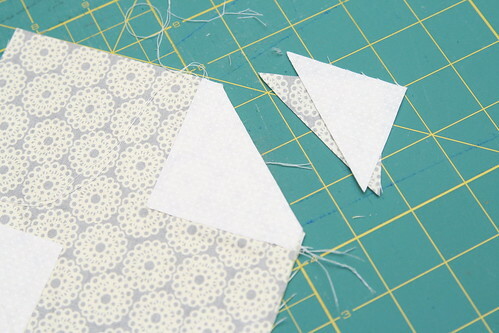 I think I will use this tutorial and cut it down to make a quilted bag. 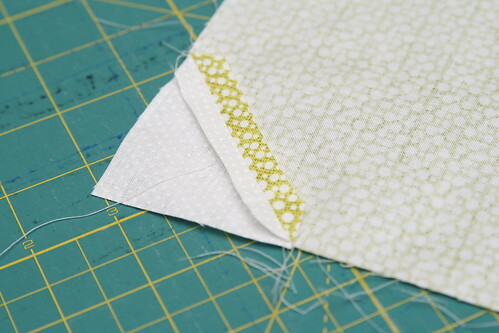 I love the fabrics you chose to use. Thanks for sharing the tutorial! I like this. Looks like it would be easy to do,but still has wow factor.